Question:? 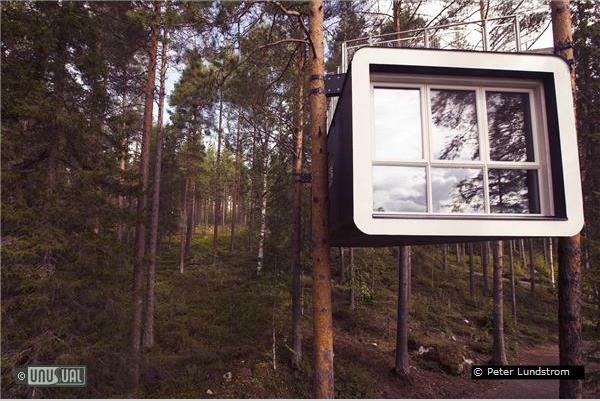 Why not create a comfortable, well designed, hotel amongst the trees, which allows visitors to live in harmony with nature ? 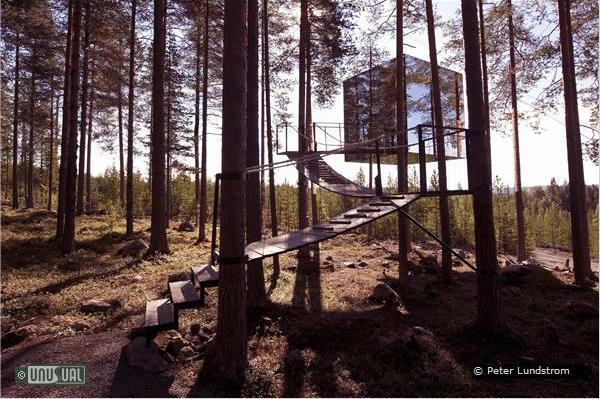 Sweden was first with the ICEHOTEL, and now offers this stunning treetop accommodation in Harads in Northern Sweden. Designed with the help of 6 well known designers and architects, the Treehotel team have turned their idea of unique treehouses, created in harmony with nature and their ecological values, into reality. 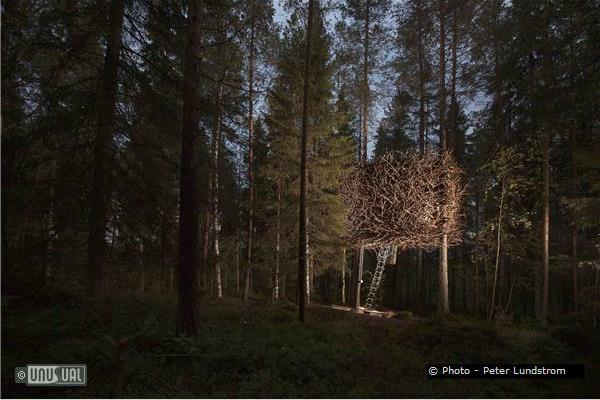 Treehotel offers a very special experience living close to nature in a place of great natural beauty. 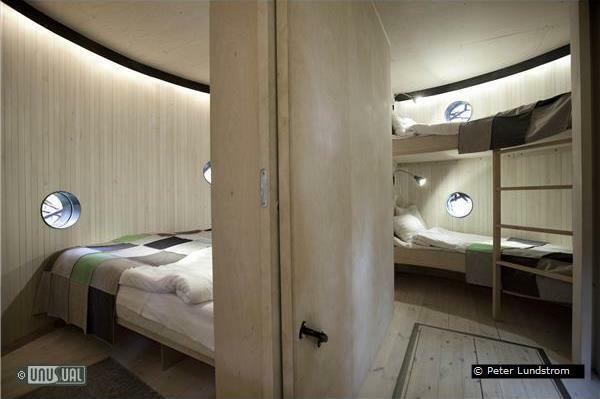 The rooms vary from 15-30 square meters and they range between 4-6 meters from the ground. 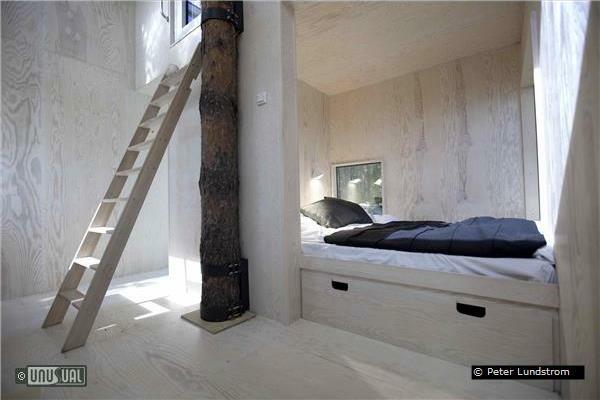 Treehotel build mainly with wood, though one room has a glass facade. 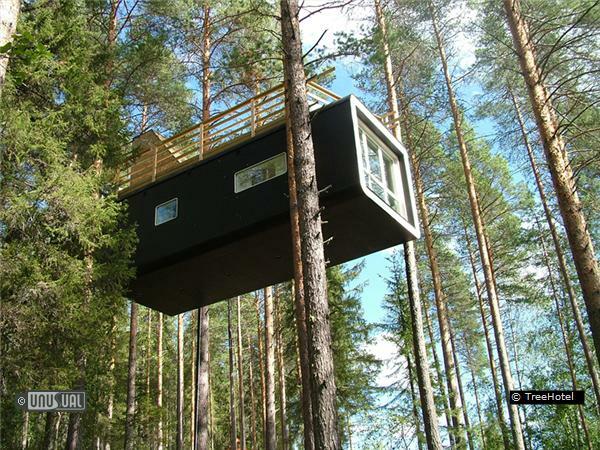 All of the Tree Houses are situated in pine trees. The rooms can be accessed by either a ramp or sturdy stairs. One of the rooms has an electric, retractable stepladder. Every Tree Room has its own living and sleeping areas. 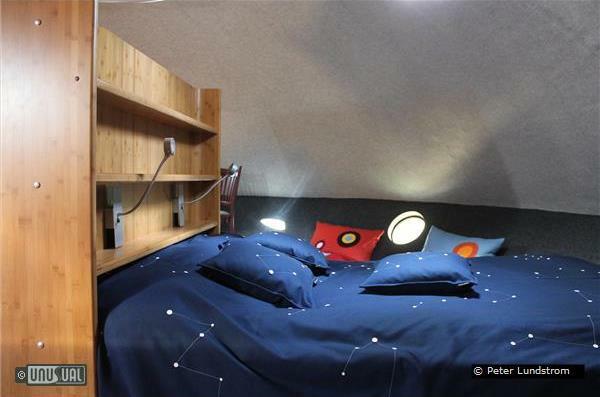 Two of the Tree Rooms accommodate 2 beds and the remaining three rooms have 4 beds, and are ideal for families. Each Tree Room is equipped with its own state of the art eco-friendly incineration toilet and water efficient hand basin, which means there is no artificial plumbing. 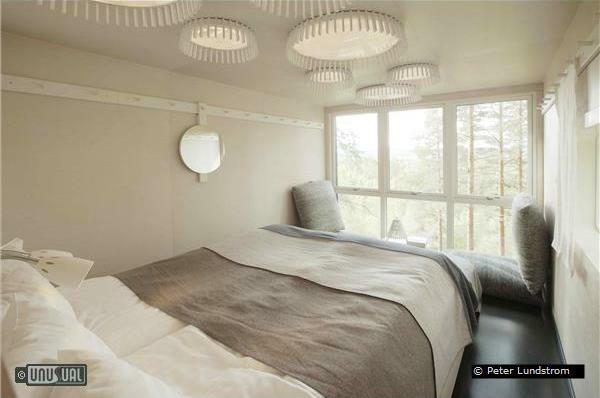 The interior of each Tree Room is uniquely designed by the architect, with its own furniture and lighting to complement the individual theme. 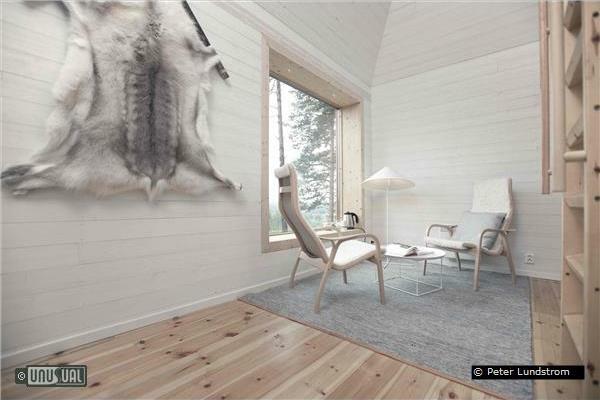 In addition there is a sauna and a relaxing area room seating 12 guests comfortably. 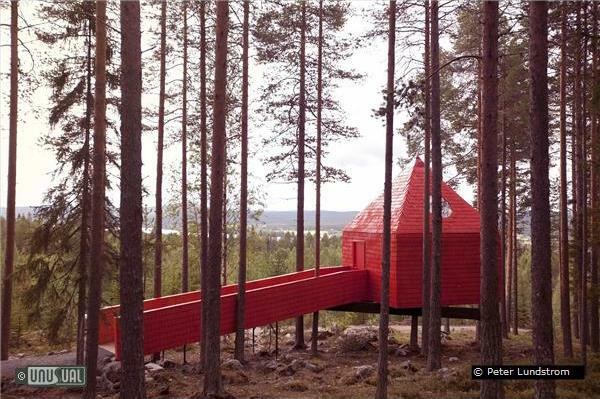 This is the first Tree Hotel in the world with a Sauna! 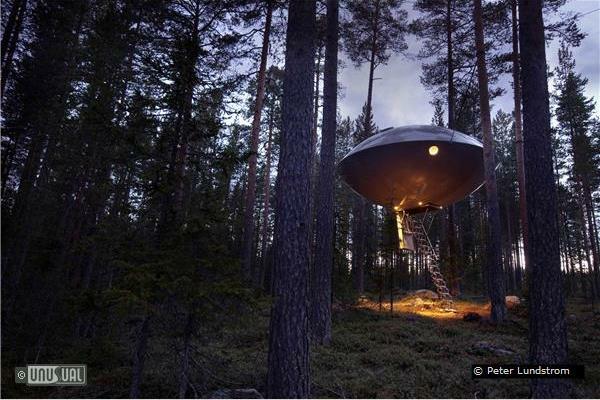 Treehotel is located in the beautiful village of Harads, in the Norrbotten region of Northern Sweden, approx 80 km (1hr by car) from Luleå airport, (the largest airport in northern Sweden), 47 km upstream from Boden. 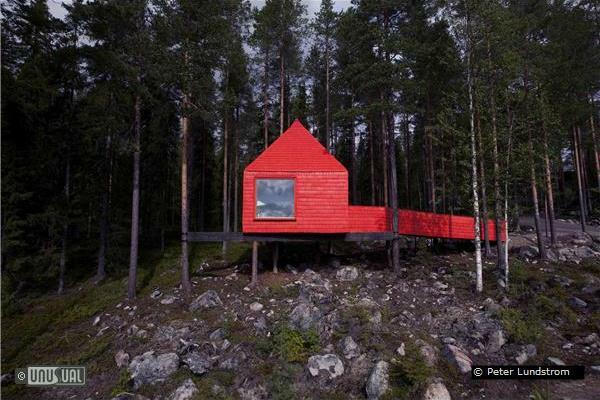 It is approximately 60 km south of the Arctic Circle. With a population of around 600, Harads has restaurants, stores, a hostel, gas station, swimming facilities, viewing areas, as well as a beautiful church. It lies in the valley of the Lule River, surrounded by still forests and coursing water, offering a back-to-nature location of serenity and wilderness. When you arrive to Treehotel, you check in at Brittas Guesthouse where you are served breakfast, lunch and dinner. There is also a restaurant, bar, sauna / spa, TV, and internet. From Brittas Guesthouse you walk up to Treehotel, a five-minute walk through beautiful countryside. Offering delicacies from the northern pantry and Swedish cuisine, their specialities are wild ingredients from local suppliers. The guesthouse serves lunch every weekday. On weekends they serve lunch to hotel guests. An a la carte menu is available if booked in advance. 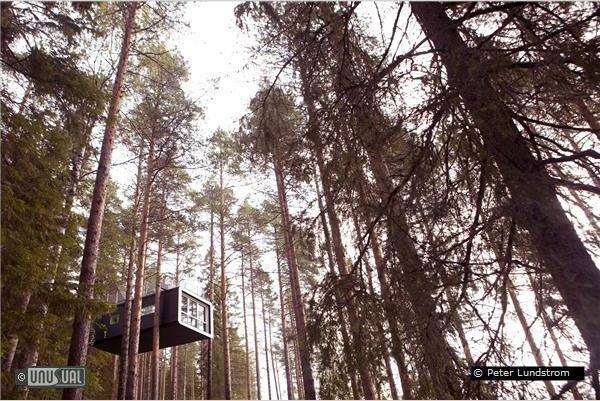 The Treehotel is open all year round, which means guests will be able to benefit from either the lovely hot summer or beautiful winter. To make this possible, each Treehotel has an electric under-floor heating system from an eco-friendly source of electricity. - Perhaps the beautiful, dark winter with its stark contrasts of black skies against sparkling white snow appeals to you? - An action-packed dog sled ride through the frozen landscape, or perhaps the calm and quiet experience of a snow shoe walk in pursuit of the magic and myth of the northern lights? - Maybe a paddle down the Lule River in a kayak, through brilliantly coloured landscapes while you enjoy the clean, crisp air that the autumn winds bring? Nature wakens quickly after the long sleep of winter. The trees come into leaf and the ice releases its cold grip on rivers and streams. The arrival of summer and its light nights is wonderful to experience on horseback, on foot or by mountain bike. At Treehotel you can experience the charm of all four seasons, whether you prefer speed and adventure, or a quiet time for reflection. Inspiration came from the documentary film “Trädälskaren” (Treelover) by Jonas Selberg Augustsen. It is the story of three men from the urban environment who look to get back to their roots by building a tree house together. It is a philosophical film about what “the tree” means to us humans, both historically and culturally. 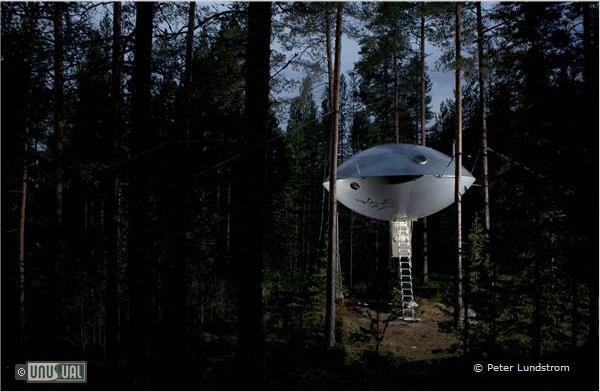 It has been Treehotel's inspiration to expand the idea into a hotel, with the added dimension of innovative modern design. They are working to make the construction and daily running of the Tree Houses as green as possible, which is consistent with their values and, they hope, yours too. 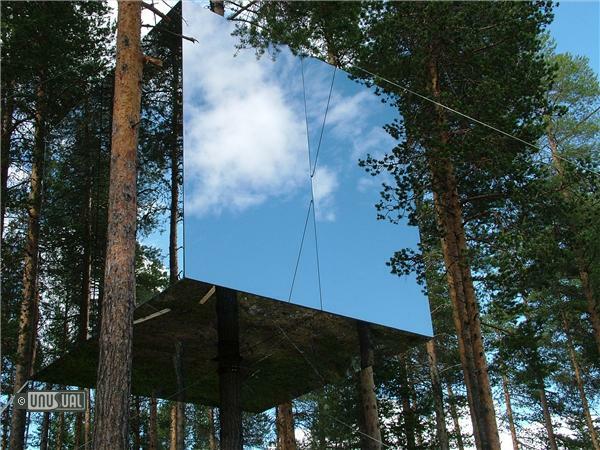 The treetop hotel is also close to the Icehotel in Jukkasjärvi. See the separate UHOTW entry for further details. Finland - The Home of Sauna For Finland´s population (almost 5, 5 million) there are around 3 million saunas. We have saunas all over, from studio apartments, sometimes even in offices - and naturally the ultimate Finnish sauna dream is to have your own smoke sauna by one of the 188,000 lakes. The Aurora Skystation in Abisko is 200km north of the Arctic circle in the middle of the auroral zone. Sited on top of Mount Nuolja, in an area of low light pollution and rain shadow, formed by Lake Torneträsk and the surrounding mountains, there is a high percentage of clear, cloudless nights. The Arctic sounds a long way away - but it's closer than you might imagine and easier than you think. One of the most iconic travel destinations is the IceHotel outside Kiruna in the far North of Sweden. 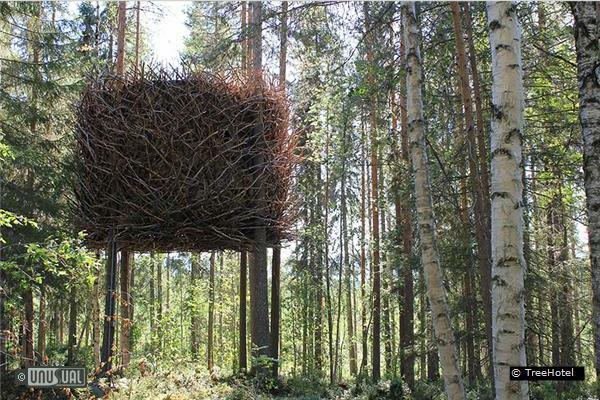 Steve flew from London Heathrow on the scheduled SAS flight, arriving at 19.50 in the evening to Luleá, in the far north of Sweden to visit the TreeHotel in Harads. Booking in advance, this leg of his trip cost around £75 including all taxes. The warmth and harmony of Kent, Britta and their daughter Sofia, the hosts, permeate from the cozy B+B to the incredible tree houses. I admire their sensitivity to ecology, their eye for design and the courage to undertake such an audacious project and succeed against all odds. My memories: the staircase as it slowly descends from the bird's nest , the smell of fresh wood upon entering the room, the feel of the "just right" beds, the healing heat of the tree-sauna, and the silence of the forest that surrounds and calms.